Tuscan landscapes, Sicilian sunsets, Roman holidays, and Florentine extravagance echo in the architectural design elements that define the Italian aesthetic. Incorporating a few of these elements into an indoor or outdoor space can generate a sunny southern European feel in any location. Ciao, bella! The easy breezy Italian architectural style looks great all over the world! Tuscan landscapes, Sicilian sunsets, Roman holidays, and Florentine extravagance echo in the architectural design elements that define the Italian aesthetic. Incorporating a few of these elements into an indoor or outdoor space can generate a sunny southern European feel in any location. 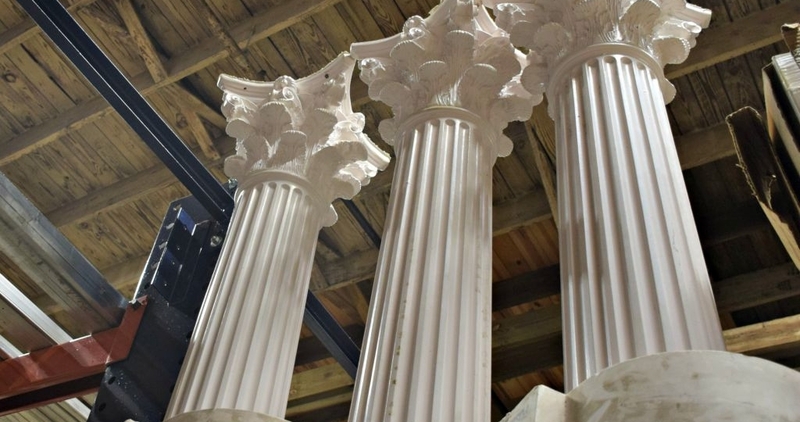 The natural patina on this fluted Ionic column recalls the stateliness of ancient classical architecture. The Romans were not the first to discover concrete, but their technical mastery of the material was unmatched in the ancient world. Modern concrete improved upon the strength of ancient formulas only by the addition of steel reinforcement rods . On the left, is it the Roman god Cupid or a cherub of the Abrahamic tradition? Things got a little confusing during the Renaissance. On the right, a cast iron trivet celebrates Jenny Lind, the great Swedish singer of Italian Operas. Corinthian order columns like these were the last of the three ancient Greek and Roman architectural orders. Although named for the Greek city of Corinth, Corinthian capitals were probably developed in Athens. The Roman usage is derivative but distinguishable from the Greek type by strict adherence to rules of proportionality and dimension. Italian marble from the city of Carrara in northern Tuscany has captivated sculptors and builders for centuries. Since the late 1800s, radical quarry workers have made Carrara the international capital of the political philosophy of Anarchy. The balustrade developed as an architectural element in the early Renaissance, as seen in the 15th century palaces at Venice and Verona. Plaster molding is as old as Classical sculpture itself, but technological advances in the 19th century have made plaster casts of classical sculpture available to the masses. An agrarian table medallion, shown here on Italian marble, calls to mind a nostalgia for a simpler time that is still found in rural Italian village life. What’s a trip to Italy without a stop in Venice? Michelangelo’s “Pieta,” at Saint Peter’s Basilica in Vatican City, is the only work he signed. He added his engraved signature only after he heard that visitors were incorrectly attributing the work to his rival, Cristoforo Solari. In the foreground, an angel yearns, a religiously-inspired sculpture typical of the Renaissance tradition. In the blurry background, a cherub gazes on. The Vespa, Italy’s post-war miracle, was invented to provide clean, reliable, and affordable transportation to the Italian people. This 1958 example shows the front wheel on a stub axle rather than a fork, a Vespa innovation that made tire changing much easier. There is no better way to cap off a trip to Italy than with a bottle of vino! If this little bottle rack won’t hold your collection, ask us about building a custom piece just for you! Picking a theme is a great way to start a redesign project. It also helps to add some focus to your next trip to Eco Relics. We admit it, our 50,000 square foot warehouse can be daunting. But if you’ve got an idea in mind before you start shopping, you’ll see our collection of architectural salvage in a whole new light.